The Rev. Richard H. Taylor (Rick) presents "Puritans in Rogues' Island: Fascinating Stories from Rhode Island Congregational and Christian History" on March 14 from noon to 1:00 PM at the Library. This lecture is free and open to the public. Bring your lunch and join us. Rick was born and raised in Patterson, NJ and is a graduate of Andover Newton Theological School. He served as pastor in churches in Massachusetts, Connecticut, Minnesota, and Rhode Island. He recently retired from Beneficient Congregational Church of Providence, RI. He is the Vice President of the Congregational Christian Historical Society. Rick has written four directories of living and extinct churches of the forerunner denominations of the United Church of Christ and is at work on a fifth book. He is well known as an historian, writer and speaker on Congregational and Christian history. Rich has stories to tell about some unusual episodes in Congregational and Christian history. In the 17th century, Rhode Island was the so-called Southern California of New England, a refuse for heretics, dissenters, and religious innovators. We look forward to seeing you March 14. We welcome your comments and edits to the entry. Watch this space for more developments in online outreach. The Devoted Life: an Invitation to the Puritan Classics, edited by Kelly M. Kapic and Randall C. Gleason. Reviews. Abraham in Arms: War and Gender in Colonial New England, by Ann M. Little. Reviews. The Indians of the Nipmuck Country in Southern New England, 1630-1750: an Historical Geography, by Dennis A. Connole. Reviews. If you are interested in borrowing these books, please email us at circ@14beacon.org or call us at 617-523-0470. We're continuing to catalog sermons into our online catalog. Some of the latest sermons entered are on the topic of morality. A couple of titles that caught my eye were "Comfort to Sodom: a Sermon on gambling preached in the Union Congregational Church Worcester, April 22, 1883" by Henry A. Stimson and "Joy in Heaven over the Penitent. A Sermon delivered in Park Street Church, before the Penitent Females' Refuge Society on the evening of Sabbath, December 18, 1825" by Justin Edwards. It's hard not to stop and read these sermons. Who was in the congregation who heard these sermons? Was gambling a political as well as a religious issue in that time? Who were the females in the Penitent Females' Refuge Society and what did they do? New records are added daily so check us out. Sacred music for 4-8 voices by beloved Jacobean composer Orlando Gibbons. We received the following Call for Papers. They have indicated a particular interest in religious history. Proposals for individual papers or panels on any aspect of Illinois' history, culture, politics, geography, literature, and archeology are requested for the Conference on Illinois History. The Conference welcomes submissions from professionals and avocational historians, graduate students, and those engaged in the study of Illinois history at libraries, historic sites, museums, and historical societies. Each proposal should include a summary of the topic and a one-page resume of the participant. The summary should specify the major primary and secondary sources used in the research. Proposals should be formal, footnoted papers. The deadline for proposals is March 20, 2007. Contact: Thomas F. Schwartz, State Historian, Abraham Lincoln Presidential Library, Illinois Historic Preservation Agency, 112 North Sixth Street, Springfield, IL 62701. Please be advised that our next Brown Bag Lunch will be on March 14. Previous advertisements incorrectly indicated a week earlier. Please join us for Rick Taylor's talk on "Puritans in Rogues' Island: Fascinating Stories from Rhode Island Congregational and Christian History". If you live outside the Boston area/outside of Massachusetts and you wish you could have one of the Research 101 seminars in your area, please inquire! We've been getting a lot of positive feedback from our Records Management booklet and following up with a seminar to discuss the logistics of caring for church records is a natural next step. Please contact me for details. This week we've had some very interesting things pop up in the course of cataloging. The first is a pamphlet that was kept in the "Infidelity" sermon collection. 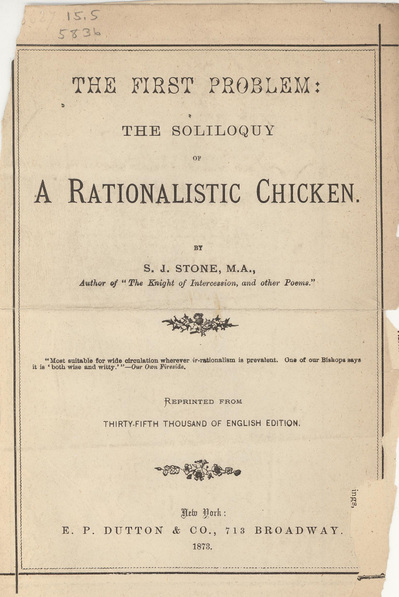 The First Problem: The Soliloquy of a Rationalistic Chicken by S.J. Stone. As far as we can tell this has nothing to do with infidelity or sermons! The second was an image was interspersed with articles collected by Albert Hale Plumb. 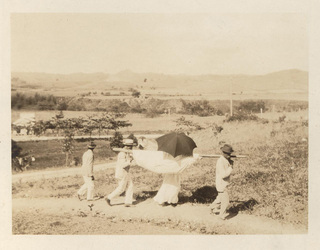 The penciled in caption on the back reads: "patient coming to the hospital". However, we do not know who the patient is, the country, or the year. We hope that you join us next Wednesday, February 7 at 12 noon for our second in a series of Brown Bag Lunch Lectures. This time Linda Palmer, actress and tour guide, will portray Ann Vassal and present "Dissent among the Puritans: The Story of Ann Vassall". Come and discover the warning that Ann is issuing to new residents of the Massachusetts Bay colony. Bring your lunch. Soft drinks and dessert will be provided.